Below are a list of tips that will help you in speaking part 1. I want to thank you for posting your concerns on the Research Page for Speaking Part 1. All your concerns will help me create a strong Advanced lesson for part 1. Part 1 will last between 4 to 5 mins. Not more and not less. You will know when part 1 starts because the examiner will turn on the recording device. In part 1, you will be asked questions on three everyday topics, such as home, hometown, work, studies, weather, hobbies, family, happiness, parks, sport, cooking, computers, school, food, flowers etc. You cannot ask the examiner to change the topic. The topics are chosen randomly by the examiner from a long list. Just because you don’t like or know much about a topic doesn’t mean you can’t talk about your past, your memories, your hopes, your likes, your dislikes, what people in your country like or what is popular. You will be asked a total of about 12 questions in part 1 based on the three topics. The questions will be about your memories, your childhood, your future hopes, your life, your family, your friends and sometimes about what people think or feel or like in your country. The examiner will indicate the topic by saying “Let’s talk about X”. Your answers will usually be between 1 – 2 sentences. You must always add more to your answers = A. Yes, I do. I swim mostly at weekends though because I don’t have much time during the week due to my work commitments. Never give two or three words as an answer. If you don’t show the examiner your English, you won’t get a good score. Always add more as explained in tip 12. Let the examiner decide when to move to the next question. Keep talking until he or she asks the next question. It is normal to have your answer interrupted – you should be prepared for that. It doesn’t not reflect your score or the strength of your answer. It is just part of the testing system. Part 1 sometimes feels like a rapid fire question section. Be ready for that. It is fine to give a negative answer. Q. Do you often go to the cinema? = A. No, I don’t. To be honest, I rarely have time. I think the last time I went to the cinema was about two years ago. Some questions might require a longer answer because they need more explaining. Q. Do you think men and women like similar movies? = A. Well, it’s hard to say. I suppose that it is common for men to prefer movies that are more action based with more special effects, while women generally go for romantic movies and comedies. Of course, that’s an over-generalisation, but I guess you could say that. If you are asked about your hometown, this means the town where you spent most of your childhood. If you were brought up in more than one place, you can choose which place to describe. If you are asked about your neighbourhood, it means the street and streets around where you live now. If you are asked Q. Do you work or do you study?, just be honest and direct in your answer = A. I work / I study / I am a housewife / I don’t work or study at the moment. The examiner will then ask you about your work, about your studies or the examiner will change the topic if you do neither. This is the only time the examiner might change the topic based on your answer. The questions are not because the examiner wants information about your life. The questions are just to give you an opportunity to show your English. Your ideas are not marked. Go to the main speaking page (link given below) to learn about the marking criteria and other information about the speaking test. Some examiners are not as friendly or encouraging as others. You should be ready for that and make sure it does not affect your performance. Your aim in the test is to speak naturally and confidently. Be chatty. Be ready to share your life, your thoughts and your feelings. Be polite, but remember it is informal. Each question is a chance to show the examiner your English. If you want more tips on preparation, topics & questions for each part, and model answers for IELTS speaking, please go to this page: IELTS Speaking Main Page. If you have taken your test already – feel free to share your experiences and tips in the comments box below. I hope you find this list useful. Make sure you follow the link to the main speaking page and get lots of free lessons and tips 🙂 Main pages for other sections of the IELTS test can be found through the RED BAR at the top of the website. There are over 300 pages of tips, lessons etc on this site – use them all. I’d like to ask you about your worries and concerns for IELTS speaking part 1. I’m starting to prepare an Advanced Video Lesson which will be a Crash Course in IELTS Speaking. To ensure I cover all your concerns as thoroughly as possible, I’d like you to share them with me on this page. What are you worried about most in part 1? Are there any types of questions you struggle with in part 1? Are there any part 1 topics that you find difficult? Is there anything you specifically wish to know about part 1? What would you most like to learn about part 1? Please post your answers and concerns in the comments box below. Remember this is for part 1, not other parts of the speaking test. I don’t have a fixed date for the Speaking Crash Course, but I would like to start planning it now. As soon as my health allows, I’ll make it – hopefully later this year. Improving a letter for IELTS General Training Task 1. Learn how to make your IELTS GT letter better for a higher score. In the IELTS GT writing task 1 test, you must write a letter which is usually either formal or informal (occasionally it is possible to get a semi-formal letter). The aims of the letter are given by IELTS as well as three bullet points which explain the content you must include. Below you will find a letter task from IELTS and a candidate’s answer. Take a look at both and then post your feedback. You ordered a book online for exam preparation. It has been some time since you ordered it and you still have not received your book. Write a letter to the e-commerce company about this. say what you want the company to do for you. Does the letter fully cover all information required? Is the information organised well into paragraphs? I am writing this letter to inform you about my order of a book form your company on 20th march and my order number is Az435677 which i have not received yet. I am preparing for IAS exam for which i ordered a book General Studies Manual by Manohar Sharma. It is the best book for preparing for this exam.. and I only got it on amazon and was out of stock from other sites. After checking the delivery time in 5 days i ordered this book because my exam is on 15th April. Its’s already been more than 10 days and i did not received my order yet.This delay impacted my preparation and I left with few days to study. I believe I can not make up for the lost time. Since you have wasted one week of delivery I request you to refund me for the book and courier charges if I will not get the delivery in 2 days. As it is hard to cover for the gone time but I am a regular customer and this is the first time i had to face this problem so I will wait for 2 more days. I hope to hear a positive reply. This letter has a number of problems. Although the task has been completed, it is wordy (too long). It is 211 words. This will not help because it means there is a lack of focus and irrelevant detail. Task 1 is only worth 33% of your marks. Keep your letter within 170 and 190 words – then move on to task 2. Opening line. For a formal letter, the opening line should be the purpose of the letter. This letter isn’t to inform someone, it is to complain or to express dissatisfaction. Remember, you have paid for something that you haven’t received – you are not happy about this. Furthermore, your opening line should only contain the main aim, not the details. The letter above puts detail in the opening line that should be in the first body paragraph. Organisation is a serious problem. There are three prompts and each prompt forms one body paragraph. You need to organise your information into these body paragraphs. BP1 – the purchase order. Give all details. In the letter above, two sentences of BP2 contained this information. So, the order of the detail was scattered and not organised into one single body paragraph. BP2 – why the book is important to you. This letter only contains two limited sentences about this. BP3 – what you want done. This should be written concisely. You want your book immediately or your money back. These are the main options. Of course, you need to word this more politely, but also word it firmly. The letter above was too lengthy and not concise enough in this aspect. Signing off. In the letter, this was incorrect. If you start with “Dear Sir”, you end with “Yours faithfully. If you start with “Dear Mr Jones”, you end with “Yours sincerely”. I am writing this letter to complain about my order of a book from your company on 1st April which has not arrived. My order number is AZ435636 and it was for a book entitled “General Studies Manual” by Manohar Sharma. It was the one which came with a CD and was priced at £15.99. The delivery was guaranteed to be only two days but so far I have waited nearly 2 weeks without receiving anything. This book is essential to my studies in preparing for my IAS exam, which is only 1 week away. It is the only book that explains some of the key aspects of the exam and without it I will struggle to get the grades I need for my future goals. If your company is unable to deliver the book within the next two days, I would like a full refund including the delivery costs. I hope to hear from you on receipt of this letter as this situation must be urgently resolved. Title – IELTS will tell you what title to use in their instructions. Remember, you have paid for something you didn’t get – keep the right tone for a complaint letter. You do not need to be submissive in requesting that you receive what you have paid for – you need to be direct and state clearly what you want to happen. You are in the right and they are in the wrong. Sign off appropriately. You do not need to use a title when you sign off, but you must use your full name. You do not need to write the word count. I have done this to show you the length. In the computer delivered IELTS test, the word count will be shown on the screen. This reading practice lesson is based on IELTS Yes, No, NG Questions. The approach is the same as the TFNG questions. The only difference is that this is about the writer’s opinions. You need to think what the writer is implying and what the writer is trying to say. Skim reading the passage paying attention to keywords, and the opening and closing lines of each paragraph. Do not look for the answers until you have thoroughly analysed the questions. You must know what a YES answer is, what a NO answer is and what a NG is before you look for the answer. Scan the passage looking for keywords to locate the information in the passage. Read around that location. Sometimes answers are based on more than one sentence. It is thought that cane sugar was first used by man in Polynesia from where it spread to India. In 510 BC the Emperor Darius of what was then Persia invaded India where he found “the reed which gives honey without bees”. The first sugar was recorded in England in 1099. The subsequent centuries saw a major expansion of western European trade with the East, including the importation of sugar. Sugar was expensive and only used as a luxury item by those who could afford it. Columbus sailed to the Americas, the “New World” and in in 1493 he took sugar cane plants to grow in the Caribbean. The climate there was so advantageous for the growth of the cane that an industry was quickly established. This food, which nobody needed, but everyone craved, drove the formation of the modern of the world. There was a huge demand for labour to cultivate the massive sugar plantations in Brazil and the Caribbean. This need was met by a transatlantic slave trade, which resulted in around 12,570,000 human beings being shipped from Africa to the Americas between 1501 and 1867. In many ways, the story of sugar and tobacco are closely aligned. Both products were initially produced through slave labour, and were originally seen to be beneficial to health. And although both sugar and tobacco have ancient origins, it was their sudden, mass consumption from the mid-17th century onwards that created the health risks we associate with them today. But in the 21st century, the grip of sugar is stronger than comparable scourges like tobacco, or even alcohol. Sugar is not only ubiquitous – it is potentially responsible for approximately 20% of the caloric content of modern diets – but also central to the world’s economy and cultural heritage. The effect sugar has on our health is considerable. A high intake of sugar causes our blood sugar levels to shoot up, giving us that feel-good ‘high’ followed by a crashing slump that leaves us tired, irritable and craving more sugary foods. It’s a vicious cycle that may be contributing to our weight problems as well as health conditions like diabetes and heart disease. The Emperor Darius invaded India to find sugar cane. Sugar was a common food item for people in western Europe after it was introduced in England in 1099. The weather in the Caribbean was conducive to the growth of sugar cane. The slave trade was fuelled by the sugar industry. In ancient times, both sugar and tobacco were considered a health risk. 20% of all people are addicted to sugar these days. The “high” people get from sugar can be compared to alcohol. Click below to open the answers. The passages states “[he] invaded India where he found [sugarcane]”. From this we see that first he invaded India and when he was in India he discovered sugarcane. This means the invasion happened first and the discovery of sugarcane was result of the invasion. Consequently, finding sugarcane was not a motivation for the invasion. Sugarcane was discovered while he was in India after having invaded it. For this reason, the answer is NO. As you see, you need to understand the meaning rather than trying to match words. If you only look for synonyms, you would not find this answer. Always look at the meaning. Also note that if the sentence had been written “he invaded India to find sugarcane”, the preposition “to” indicates reason/intent and this would give the answer YES. So, you can see this question really tests your understanding of English. This was a very challenging question, so don’t worry it you didn’t get it correct. Hopefully you got all the others right. The keyword is “conducive”. You needed to understand this word to get the right answer. It means that the weather was good for growing sugarcane in the Caribbean. The answer is found in the last two sentences of the first paragraph. This is found in the second paragraph. The need for labour for the sugarcane industry resulted in slave labour. Third paragraph – they were thought to be beneficial to people’s health originally. The passage gives information what proportion of calorie content in our diet is sugar. However, it does not give information about how many people are addicted. We do not know if 20% of people are addicted. We do not know if addiction accounts for more or less than 20%. The passages does not say anything about percentages of addiction. The last paragraph does describe the “high” from sugar as “feel-good”, but it does not compare this high to anything else. A practice table for IELTS writing task 1, academic paper. This is a great table to help you practise organising information into paragraphs and to practise highlighting key features in an overview. Take your time to review the table below. You should spend at least 3 mins spotting key features and deciding how to organise information into body paragraphs. You should never spend more than 20 mins writing your report. Please remember this is a report and not an essay. This table was not created by IELTS Liz. Sourced online. Click below to reveal the model answer. Please try to write this task on your own before you check the answer. 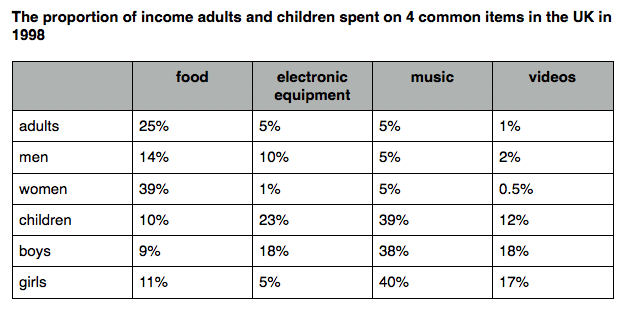 The table illustrates the percentage of income that was spent on food, electronic equipment, music and videos by both adults and children, divided by gender, in the UK in 1998. Overall, adults spent less of their whole income on the four items compared to children, who spent most of what money they had. The main item bought by adults was food, which accounted for a quarter of their salary, as opposed to videos (1%). Children spent most of their money on luxury items with music being the main expenditure (39%), whereas food accounted for the lowest of their expenses (10%). In terms of adult expenditure, there was a significant difference between the money spent by men and women on both food (39% and 14% respectively) and electronic equipment (10% and 1%). Spending on music and videos was 5% or under for both genders. Girls spent 2% more than boys on music (40%) and also on food (11%), while on videos boys spent 1% more (18%). The item with the biggest disparity between boys and girls was electronic equipment where boys used 18% of their income in contrast to girls who used only 5%. The introduction is a paraphrase of the information given with the categories listed. The overview is complete and full. This is the most important paragraph and the examiner will mark you strictly on it. The overview contains some data because they are totals. This is common with tables, but not common with other types of task 1. The body shows how detail can be grouped together to avoid too much detail. Too much detail is to be avoided. See the last sentence in BP1 to learn about grouping information together. The body also highlights differences and similarities in data. Comparisons are organised and logical without being confusing for the reader. Not all types of task 1 will have comparisons. They are used only when relevant. The first sentences of the body paragraphs show what is being written about “In terms of adult expenditure…” now we know the paragraph is about adults, not children. Paraphrasing is used “spend money on / money used / expenditure” and “salary/income/money” and “difference/disparity”. Information is not repeated. For this reason, there is no conclusion. Task 1 is a report, not an essay. The overview can be put at the end instead if you wish. Word count is around 193 words. You should not usually need to go over 200. Anyone who frequently writes over 200 words for task 1 is not using the right techniques and is putting in too much detail instead of grouping information appropriately. The key to a good report is that information is easy to read and understand. Language is complex, but information is simply organised and presented so that the reader can follow easily it and grasp the content quickly.